Montpelier, Ohio, was the hometown of Sgt. Michael Paul Hodshire. Michael served as a Squad Leader with Easy Company, 2nd Battalion, 2nd Marine Regiment, 2nd Marine Division, II Marine Expeditionary Force, Camp Lejeune, North Carolina, deployed to Iraq. His mother was Tarry (Eicher) Fikel, the proprietor of Eicher’s Subs in Downtown Montpelier. On October 30, 2005, Tarry got the news that no friend or family member of anyone serving abroad wants to hear…Michael was killed in action by Iraqi insurgents. Michael died of wounds that he sustained on October 29 from an improvised explosive device during combat operations near Nasser Wa Salaam, Iraq. At that exact moment, Tarry Fikel became a Gold Star Mother, the mother of a serviceman or woman who fell in the global war on terror. 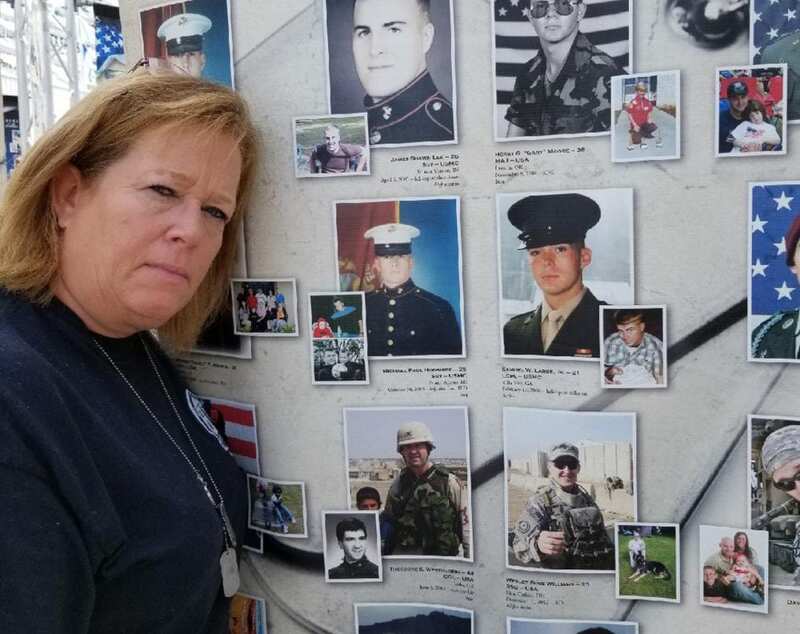 It has been fourteen years since her son paid the ultimate price for Operation Iraqi Freedom, but Tarry has not rested a day. She remains dedicated to the memory of her son, as well as every other person who donned an American military uniform and lost their lives in the ongoing war against terrorism. That’s the reason why she is bringing in the Tribute Towers of Remembering Our Fallen. Remembering Our Fallen is a traveling photographic war memorial that honors the fallen of the American military from the War on Terror. It’s been a daunting task, but Tarry is investing a lot of time and tears into the effort. It’s one thing to be seeing all the faces of those that you do not know. Recalling the moment in which she first saw the portrait of Michael in his Marine dress blacks brought an onslaught of tears. The concept of bringing the Tribute Towers to the Williams County Fair is neither inexpensive, nor is it simple. There is a five-figure expenditure involved in this undertaking, which is going to call for fundraising…a LOT of fundraising. This is an arena in which Tarry has never been. She is an Eicher. You want to talk pizzas and subs, and Tarry has got you covered from every conceivable angle. Fundraising though…that’s an entirely different animal, and she is stunned by the requirements of it all. Still though, if you think that the lady who conceived and created the largest pizza ever made in Williams County would ever back down from a challenge like fundraising on a large scale to bring in the Tribute Towers, you need to take another look at who is answering the bell. Yes, Tarry is an Eicher, but she’s also a Gold Star Mother. Her son is on one of those tapestries. The Motivator is still living up to his namesake. While fundraising is already underway, there will be a major community fundraising event on Saturday, June 29 from 1:00 p.m. to 8:00 p.m. at the Williams County Veterans Memorial Building. That event will feature a benefit lunch featuring an American summer fare of food and fun. There will be live music, a poker run, and a silent auction. Donations are being accepted for the silent auction, as well as for the food for the event. To arrange a donation, please call Tarry at 419-485-1678. Financial donations to go toward the expenses for the Tribute Tower transportation and staffing are always welcome, of course. Monetary donations can be mailed to the Williams County Veterans Service Office at 1425 East High Street in Bryan, and Tarry would be happy to answer any questions that you might have at the number above. Word to the wise…don’t bet against this Gold Star Mother. 1 Comment on "Montpelier’s Tarry Fikel Is A Gung-Ho Gold Star Mother On A Mission"